Black Water by Cormac O’Keeffe. I love Dublin; the atmosphere; the bars; the history and the people. I’ve visited three times twice in the 90s and once in the last five years. One of the best places for the craic and a few pints of the black stuff which does taste better there! I’ve walked down Grafton Street and Molly’s statue but…. Black Water is a different Dublin! It’s not the Dublin I could have imagined before reading this well written and graphic novel about the darker side of the city. It is as billed like ‘The Wire’ with young broken kids doing the dirty work for the gang bosses. They’re also a young local soccer team led by Shay from the community trying to give them a better time. I initially got lost with the fast pace: different characters popping up in a few pages. A death early on draws in the Garda to investigate. The circumstances around the windscreen wipers are a starting point for Garda Crowe to unravel the threads! She has a possible leak to the gangs from inside Garda to deal with- who can she trust? Jig for one has drawn my affection for all his flaws and misguided actions. There’s his mates too – impressionable kids – are they already on the social scrap-heap? Answer them for yourself- Black Water has to be read! I love this book it’s gripping; page-turning stuff and I give it five stars! Good strong characters and soundly plotted. Looking forward to the next. Author tonk5eyPosted on April 18, 2018 April 18, 2018 Categories CRIME, UncategorizedTags Ireland, ThrillerLeave a comment on Black Water by Cormac O’Keeffe. Another exciting page in the continuing Portsmouth Procedurals with Faraday and Winter and more Jimmy Suttle. I read this one, not a mean feat at 500+ pages, in a few days. Whilst this time last year I was struggling to find time and brain space to read I am now still travelling and working away but this now gives me the time to consume books at an increasing rate. In fact I am on no. 24 of 25 of my annual Goodreads challenge. I thought I’d set the bar quite high after only managing 20 at a push in 2015. I think I am reading faster into the bargain. I read on Graham’s web page that his wife keeps ‘the charts’. I can only imagine these are extensive because the plot in each book always refers backwards to previous episodes. The book of the blog. In this one we get a glimpse of how Winter is coping with his life changing event from a previous book but he will never really change his ways. Eadie, Joe’s most recent squeeze is out of the picture in this book, and J.J. doesn’t figure much either, but Joe does almost get involved with another woman with a thread from Angels Passing coming across his bows. This one isn’t about Bazza Mackenzie, either, for a change. After the previous attempt to bring down his empire, we’ve moved on to a headless body at a bird watching site on the Isle of Wight, where in fact most of the action takes place with Joe as SIO and Willard putting on the pressure. Meanwhile, working for Cathy Lamb on the crime squad, Paul and Jimmy are after a local business man called Wishart, after nicking a well known defence solicitor for possession and another guy for living on immoral earnings. Paul gets more than he bargained for out of the deal in the book and ends up with a nasty headache but a great new piece of skirt on his hands; she can be a headache too! Joe is after a former squaddie for the headless dead body but they dont know who it is which makes pinning it down even harder. Helping Joe with this one is Tracey Barber, down on placement from London, she has a background in Special Branch which ties in nicely with the main plot. There are big references in this book to Bosnia which is where the main target has his allegiances and it appears also got a young and vulnerable ‘wife’. What makes the story spin is the target runs lodgings and a care home on the island where a missing man had an argument with the owner. The missing man, not seen for months, seems to tie in with the body that is bloated and apparently chewed by sea creatures so not easily identifiable especially without a head. He had been visiting his ‘nan’ in the home but she’s unreliable because she has dementia. It’s a big book as I said but very enjoyable, very easy to read and I am on to the next one already called One Under. As you know if you read my blogs I dont like to give anything away about the outcomes of books. I love all the local references which make these books very special to me. I give it 5 stars because it flows, keeps you gripped whilst it leads you all over the place. The climax is good and whilst again a study of some political history with the backstory of UN peacekeeper forces in Bosnia. 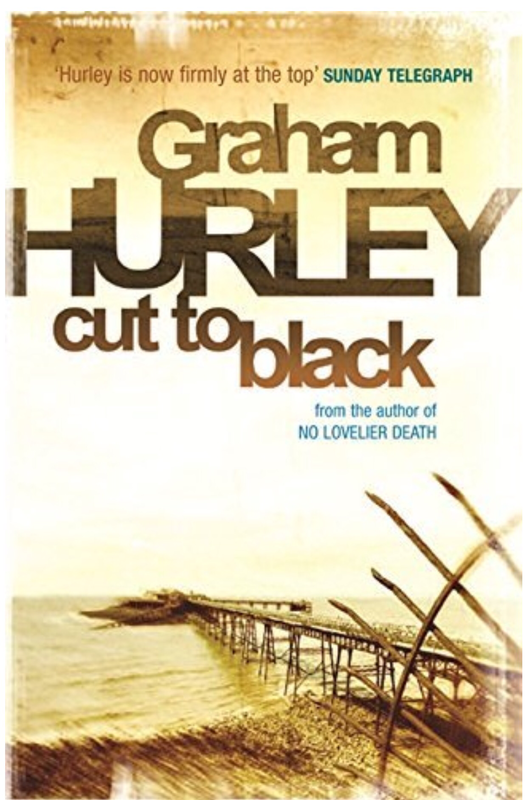 In my last blog I was in catch-up on Graham Hurley’s Portsmouth Police Procedurals featuring DI Joe Faraday and also dipping into the continuation of these in the Jimmy Suttle series set in the West Country. I have now read no. 5 called “Cut to Black”I raved in my blog about the procedural narrative, the lives of the coppers and their personal battles, and the use of the back-drop of Portsmouth as an added bonus for me living in the area where most of the crimes are perpetrated, the police and perpetrators live. The nastiness of the crimes in some of these cases has me now looking over my shoulder for Bazza’s mates, wondering if the lad with the hoodie loitering by the bike-rack at the station is up to no-good! The site of an unmarked Ford Fiesta parked at the side of the road with two dodgy looking blokes sitting there could be a couple of Kingston Crescent DCs watching an address or someone in particular. The sound of a siren, usually a head-turner anyway, now has my imagination fired-up even more. Cut to Black follows the continuing exploits of Faraday and Winter. Faraday is still in Major Crimes and gets appointed to take over a covert operation to bring down the aforementioned crime-boss in Pompey “Bazza” who has almost completely separated himself from being ‘a mush from Copnor’ ; from his away football fan roots in the notorious and violent ‘6:57;’ his evolution into drug-dealing, the foundation of his fortune, and then his move to appear legitimate by setting-up businesses and buying property to help him wash his dirty money. Joe’s appointment is a result of one his colleagues being seriously injured in a hit and run accident. J.J., Joe’s son is now making serious documentary video’s with Joe’s now girlfriend Eadie Sykes and this leads to some trouble for both father and son and a conflict of interest! Meanwhile Winter is now part of a crime-squad aimed at proactive policing – their task is to try run out of town some drug dealing ‘scousers’ who are treading on Bazza’s toes. Paul is partnered with Jimmy Suttle in this story and he learns some valuable lessons from Winter with hindsight. This novel also has a lot of political ooomph as it’s set in March 2003 during the invasion by the US and UK of Iraq and the toppling of Sadam Hussein. I found this weird timing – I started reading this book just after the Chilcott report was published. The novel for me wasn’t so much about crime but about the people involved in it and how far their web can be spun. It’s about drug culture and the potential the money coming from that has for changing the economic fortune of an area. Following on from ‘Black Wood’ – ‘Willow Walk’ sees us back in the fictional Banktoun following Davie Gray investigating drug-related deaths amongst teenagers in the region for his colleague in CID – Malkie. Does Davie want to join CID at his age? His private life overlaps this story in a big way when a woman is found badly wounded and Malkie thinks it’s someone Davie knows! When he goes to the hospital it turns out not to be the girl – Marie – that he’s been dating on and off, but they have a lot of similarities but one key identifier isn’t on the injured victim. In parallel with this Marie is receiving letters from someone called Graeme. As the story unfolds we find out who the mystery letter writer is and when he turns up in Banktoun things get messy for Marie and for the rest of community especially in the location of the book’s title. Davie is hot on the trail and has discovered a link between Marie and a missing mental hospital patient as well as being hot on the trail of the ‘drug’ pushers. Overlapping all this is Laura from the first story – one of Davie’s karate students and her escapades with a boy – a rite of passage for her, leading to her playing a part in the conclusion of the mystery letter-writer – when it all goes to mayhem. I wont say anymore about the plot as I will spoil it. I was, I must admit, initially, a little dissapointed that not all of the main characters from Black Wood were featured but as Davie is the copper in the mix he is central to Willow Walk even more than he was in Black Wood. This makes Willow Walk a standalone if you haven’t read Black Wood, but my followers will know I like to read in order. This is another excellently written page-turner from Susi. A true nail-biter. I’d read the first in a matter of days despite having a day job and read this one in a similar time frame, consuming hundreds of pages sometimes in one sitting. That speaks volumes for me about the fluid way in which the narrative flows, alternating between Davie and Marie and ‘the letters’ she receives. The letters that keep appearing in the novel add to the ultimate creepiness of this story. Willow Walk – as I said in a recent post on social media “if it’s half as good as Black Wood we’re in for a treat”. Black Wood is also on eBook, Print and Audio Download too! Moving to the north, in fact, Scotland and Banktoun a small, close-knit community where everyone appears to know everyone else and this is fueled by the town gossip monger Bridie. I read this having received a review copy of Willow Walk (my thanks to Laura at B&W) which I am now reading in earnest to follow the lives of the characters from Black Wood. I have to add this isn’t my normal reading as I tend to do police procedurals so approached it with some reticence but it had me gripped and my first session got me well past page 100 as I just couldn’t put it down and ended up on the settee into the early hours. 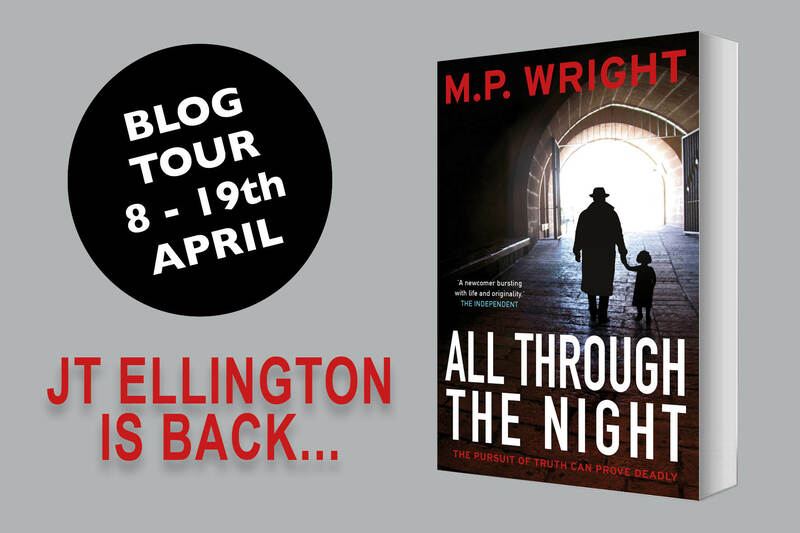 There are a lot of mysteries in this excellent thriller that kept me gripped and reading – I completed it in less than a week which is a challenge sometimes with my other commitments. Why is Claire in a wheelchair? Why is Jo on medication? Who is Jake? Why is he so devoted to Claire? Why does Scott split up with Jo which forces her to move out and into her friend Craig’s flat ? Why does she then run off to her late grandmother’s cottage – Black Wood? Who is the stranger that comes into the bookshop where Jo works? Why do the locals think a witch lived in Black Wood cottage? Then there’s Pete who see’s things from his house but his father doesn’t want him to talk to Davie Gray. Davie Gray – the local police sergeant influenced by ‘mod’ culture who rides a motor scooter when he’s not in a panda car. He’s troubled by the threat of closure of his police station now that Police Scotland has been formed and there are rationalization plans all over. In addition to this someone is frightening girls down at ‘The Track’ a place where the teenagers go for illicit drinking, smoking weed and dalliances. Jo thinks she knows the stranger and is determined to find out who he is and what he is up to? We also see the story from Davie’s perspective too as he struggles to deal with the many facets of this excellent read. Susie’s (SJI) great novel is the first of the Banktoun trilogy and I think deals with people’s interpersonal relationships and feelings and fears in a sympathetic way. I very much enjoyed this read and the way that the plot and mystery are maintained is refreshing!The events of the book are played out in a very clever way swapping backward to times when Jo and Claire were themselves teenagers and the strong narrative introduces a ‘boy’ in the past as we see the story from his perspective and also from Claire’s and Jo’s at different stages in the story. The main character, however, is Jo and we see most of the current day events from her angle. It’s a very complex plot that weaves between different people and the past and present. It’ll keep you on your toes throughout. I can’t recommend Black Wood enough as it sets the scene for the trilogy but it’s also an excellent stand-alone thriller. watch out for the Blog Tour! 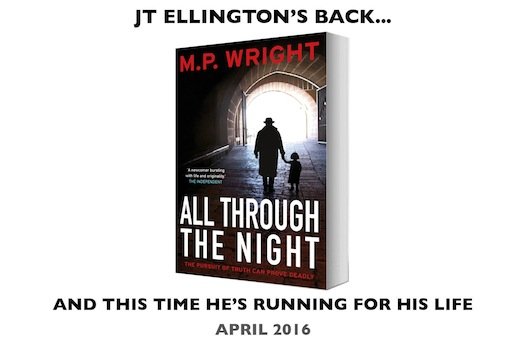 JT is on the run ‘All Through the Night‘ and there are a lot of long tough nights in this excellent follow-up to Heartman by M P Wright. First, my great thanks to Laura at Black & White for sending me this review copy and introducing me to JT Ellington and of course M P Wright (MPW). As soon as I received All Through The Night (ATTN) and realised it was a follow-on I ordered Heartman from that well know online bookstore. I read most of Heartman on holiday in a sunny and warm climate – not sadly Barbados from where JT Ellington originates in the 1960’s. He comes to England and Bristol at the height of endemic racism where, as is really well described by MPW, JT can’t enter some bars or pubs without getting looks from the indigenous population because of his colour. Let me point out before I go too far in this blog that Heartman and ATTN are readable as standalone novels but actually part of a planned trilogy. You don’t have to read them in order but I am a big advocate of reading books in order, not publication chronology but storyline timeline as I love to know the back-story. If you don’t read Heartman first enough of JT’s back-story is explained to not spoil the main plot but it does give away some of the outcomes of Heartman; I will let you decide how you approach this challenge. I started reading ATTN in the same warm climate, then finished it just this weekend gone in the comfort of my own home in the warmer than I left for holiday south coast of England, but still cold compared to Barbados. ATTN starts with a prologue in US AirForce transport plane where a suspicious cargo is being transported which ends with two unexpected happenings. We then switch to Bristol when JT is now an established ‘Enquiry Agent’ doing those things people don’t want the police involved in and naturally he accepts all kinds of work to keep the wolves from the door; in fact, he probably gets a lot of his work from the black community so is surprised when a white female arrives in his office with a lot of money and asks him to find a missing black doctor of dubious morals. He has stolen from her employers and wants JT to ask the doctor ‘for the truth.’ The plot now opens up into the need for JT to go on the run with what he finds. The story takes him away from Bristol and as he moves around he leaves a wake of violence amongst those close to him and those who help him along the way. ATTN isn’t the typical book I read, usually, I read police procedurals when I’m reading crime. This is a Chandler type novel; I believe ATTN has also been compared to ‘The Thirty-Nine Steps’ which gives you an example of the pace of the narrative. It’s written from JT’s perspective – all through the book – you are dragged along with him in cars, caves, mine shafts and nighttime chases to evade those chasing him. I have to admit that I had to put ATTN down at some points because the tension in the plot as he races around trying to evade the bad guys and keep them from the Truth was sometimes too much for my blood pressure. I think this boils down very simply to the strength of the narrative – it makes you feel as though you’re there with JT and under the same threat as he is. I also like the feeling of menace, isolation, and separation in ATTN (and Heartman.) This is also brought about by the strength of the narrative, the attention to detail and also because of the decade in which they are set – there are no mobile phones, no fax machines, no internet, the technology isn’t there although JT and his cousin do get to use an ‘old fashioned’ cassette recorder. Simply finding a telephone and using it can sometimes lead you into unexpected danger. I can’t wait for the next one The Reckless Coffins I think it’s called which MPW is writing as a write and as with all best-laid plans, there will be a fourth instalment The Rivers of Blood – taking a leaf out of the style of the late lamented Douglas Adams, perhaps? I love ‘JT’ Ellington as a character – another human being with baggage, a damaged soul with no reason to do what he does but he can’t see wrong being done to people and wants to do the right thing. He is another character that has become part of my psyche. I highly recommend ATTN to anyone that loves a gritty and bloody, no holds barred novel; a novel for anyone who isn’t squeamish – this is not for the faint-hearted – and despite the trail of destruction ATTN does have a happy ending! Post script …. I’ve discovered some additional ‘JT’ reading since publication how remiss of me but here they are ….